Season I of The Ex-Recruiter prime-time Blog Talk Radio Show will launch January 11 at 8:00p.m., EST. The show will feature host Paul Paris, Founder and CEO of Recruiterreqs.com Inc., co-hosts Janice and Jeremy Worthington, of Worthington Career Services and special prime-time co-host Karla Porter Director of Workforce Development and Human Resources at the Greater Wilkes-Barre Chamber in PA. The prime-time spin off will air on the 2nd and 4th Monday of each month and takes on a different format than the popular Tuesday 12:00p.m. show with Pariss roundtable of Recruiters. The 2nd Monday of each month the show topic will be Extreme Candidate Makeover. Job seekers will submit their LinkedIn profile for review and a panel of Recruiters, Coaches and Resume Writers will review, analyze and coach the candidate. Guests for the January 11 show are job seekers Shennee Rutt and Arleen Sarppraicone. Invited panel experts will be August Cohen and Karen Swiak. Rutt has worked in staffing, sourcing and retail. Her ideal job is HR Generalist in the York, PA area. She feels the varied experience she has in diverse sectors of HR qualify her for that role. Rutt has been unemployed since December 2008 and has had interviewed but not had offers. She can also be found on Twitter @Shennee_Rutt. Sarppraicone was downsized after an 13 year career with Starbucks Coffee Company where she worked her way up from Barista to Receptionist, HR Coordinator and ultimately Staffing Coordinator III. Her goal is an Executive Assistant or HR Coordinator position in the Orlando, FL area. She has been unemployed since May 2009 and currently volunteers as Social Media-Administrative Assistant for LinkedUp Orlando. Sarppraicone can also be found on Twitter @Arleen14. Prime-time shows the 4th Monday of each month will host invited leaders from a variety of industries. The panel of experts was outstanding, I wouldn't even want to guess what the figure would be for their combined 90 minutes of professional advice would be. Want to here the recording? 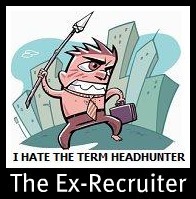 Listen to the January 11th archived show here http://www.blogtalkradio.com/the-ex-recruiter. You can also check out the Twitter stream, (it was quite lively) #TERS. Join us February 8th same place same time!